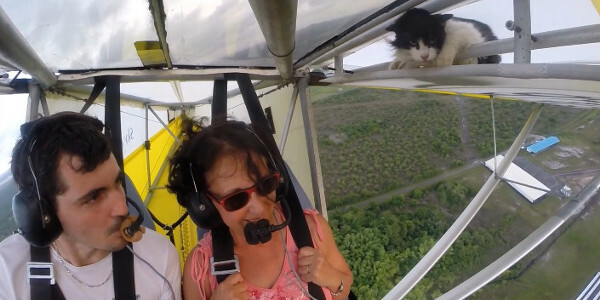 Romain Jantot missed a stowaway cat during the preflight of his aircraft, or he missed the feline when it jumped on board the airframe before taxi (yes, a cat… makes you wonder if he’d notice a missing wing, right?) Either way, it exposed itself to the pilot and passenger a short time after takeoff. The pilot, maintaining his composure, returns to land without incident. Thankfully, the cat is doing well… although it’s reported that it has a newfound respect for birds. Having trouble watching the video? Watch it on our Facebook page . Be sure to like Flight while you're there. If buttered bread always lands buttered side down, and a cat always lands on its feet… what happens if you strap buttered bread to the back of a cat and throw it out of an ultralight? This was the perfect opportunity to find out. Next time. Romain Jantot says the cat is doing well, and it “still our mascot”.